The U.S. 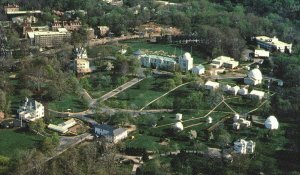 Naval Observatory is a government observatory, founded in 1844 and originally based at the aptly-named Foggy Bottom on the banks of the Potomac River in Washington, D.C. It was from here, using the 26-inch Clark refractor – the largest refracting telescope in the world at that time – that Asaph Hall discovered the two tiny moons of Mars, Phobos and Deimos, in 1877. The atrocious seeing conditions at the original site led to the observatory being relocated to the northwest of the capital in 1893, at which time it also absorbed the U.S. Navy's office of the Nautical Almanac. Since 1955, the U.S. Naval Observatory has operated an observing station near Flagstaff, Arizona, at an altitude of 2,315 meters.